This ball pool is a perfect size for toddlers. The walls are 4" thick foam and 12" high. It requires 53" square floor space. 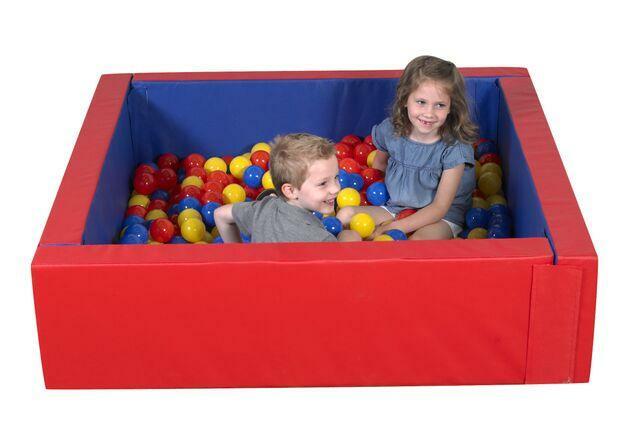 Includes 500 multi-colored polyethylene balls, which provides multi-sensory tactile stimulation. 45" Square inside dimension. Made in USA. Recommended ages are 2 to 6 years old. The vinyl floor (not padded) attaches to wall with hook & loop fasteners.